The Centre for History and Philosophy of Science (HPS) at Leeds is one of the foremost academic units for the subject in Britain, with nine permanent and several fixed-term staff, and a large and international body of postgraduate and postdoctoral researchers. Newcomers are always welcome, and quickly come to appreciate the combination of scholarly seriousness and collegial friendliness, along with the library, archival and object collections that support our teaching and research. We are also home to Museum of the History of Science, Technology and Medicine. 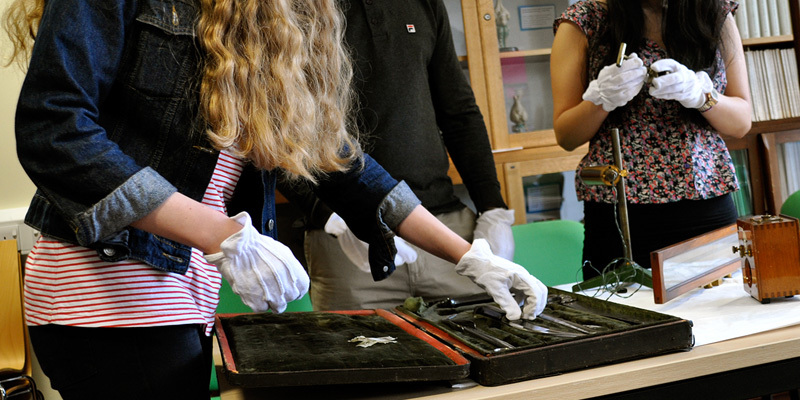 Its rich collections provide exciting opportunities for research, and for developing skills valued in the museum world and more generally in the workplace. A wide range of history and philosophy of science modules and teaching are available at every level of undergraduate and Masters degrees. We offer supervision and support to students undertaking research degrees in a wide range of topics in the history and philosophy of science. Supervision is available for PhD, MPhil and MA by Research. Our graduates have gone on to careers in various organisations, inside and out of academia, in the UK and across the world. The Centre encompasses a vigorous research culture, in which both individual and collaborative projects are supported by a strong spirit of collegiality. Particularly distinctive of Leeds is the close interaction between historical and philosophical scholarship, which yields valuable critical and historiographical insights. Research embraces many aspects of the history of science, technology, and medicine, from the 17th century to the present day. The Centre is also at the forefront of current research in the philosophy of science, including structural realism, the nature and role of models in science, the nature of scientific representation, and integrated HPS. The Centre for HPS regularly secures external funding for research projects. Find out more about research projects in the School of Philosophy, Religion and History of Science. We frequently host a diverse range of events, from small specialist seminars and workshops to large international conferences to public lectures. These are sometimes held in association with leading professional organisations, in which several staff are heavily involved. Our main seminar series takes place fortnightly with visiting speakers from the UK and overseas. A weekly work-in-progress seminar also allows staff and postgraduates the opportunity to present and respond to current research work in a more informal setting. Members of the Centre also benefit from seminars organised by the School of Philosophy, Religion and History of Science and its other research centres including: Metaphysics and Mind, Ethics and Metaethics, Aesthetics, the Interdisciplinary Ethics Applied Centre, and by other groups in the University. At any one time, numerous informal reading groups are under way in the centre, covering various aspects of research in the history and philosophy of science, technology, and medicine. Director of the Centre for History and Philosophy of Science is Dr Michael A. Finn. Formally, Leeds HPS dates back to 1957, when a local philanthropist, Bernard Gillinson, donated funds to establish a new academic unit. Informally, the subject was already familiar, and in certain respects thriving, with previous Leeds contributors including the physicist Norman Campbell, author of What is Science? (1921); the mathematician Selig Brodetsky, who published a biography of Newton in 1928; Mikuláš Teich, a chemistry undergraduate who, with Brodestky’s encouragement, wrote a prize essay on Newton that Nature printed in 1944; and the philosopher Mary Hesse, whose first book, Science and the Human Imagination: Aspects of the History and Logic of Physical Science, came out in 1954, while she was working in the mathematics department. But it was the arrival in Philosophy at Leeds of the Wittgenstein-trained philosopher Stephen Toulmin, author of The Philosophy of Science: An Introduction (1953), which led – with the support of other Leeds academics, notably the historian Asa Briggs – to the founding of the Division of History and Philosophy of Science. In a 1956 article, Toulmin set out what remains a compelling case for university support of a specialist HPS centre. As a teaching subject, he pointed out, HPS is uniquely well placed to ensure that, in an increasingly science-dominated age, arts students acquire some acquaintance with scientific thinking, while science students learn something of the wider historical and social contexts that can spur independent-mindedness about their sciences. As a research subject, professionalised HPS promised to take knowledge of the scientific past beyond where gifted but often axe-grinding amateurs had taken it. What Toulmin called for was the training of HPS scholars belonging self-consciously to an evolving tradition, with high standards and a common sense of core achievements. Over the last 60 years, the Centre for History and Philosophy of Science has been home to a community of teacher-scholars that, for all the many changes of personnel and intellectual persuasion, has remained true to this invigorating vision of the discipline and the needs it serves. Indeed, something originally planned as part of the unit has recently come to fruition: an associated Museum of the History of Science, Technology and Medicine. For a glimpse of HPS at Leeds in its recent state, have a look at the “HPS in 20 Objects” public lecture series, in which, throughout 2016 and 2017, staff and students used objects from the Museum as springboards for accessible surveys of the subject, from antiquity to the present, and from physics to psychology. For more on the history of HPS at Leeds, see the entry in Wikipedia and for all the latest news follow us on Twitter @hpsleeds.